Sagrantino di Montefalco is an ancient grape variety grown only in and around the hilltop town of Montefalco in Umbria. Montefalco is one of the few places in Italy where wine was made inside the town walls. Sagrantino is an indigenous grape variety that is not related to any other grape cultivated in central Italy, producing both dry and sweet wines of particular greatness. The age and origin of Sagrantino, the ‘newest’ noble wine variety of Italy, has always been controversial. Nothing definitive is known about the origins of this grape varietal. It is possible that Sagrantino was brought in from Asia Minor by the followers of St. Francis or perhaps from the invasions of the Saracens or even the Greeks. According to recent research, the first mention of the cultivation of Sagrantino dates back to 1549 in Montefalco. After almost completely disappearing from Umbrian vineyards in the 1960s, Sagrantino was revived by a few pioneering wine producers. These producers obtained the D.O.C. label in 1979, followed by the D.O.C.G. label in 1992, placing the official seal on an important local tradition. In 1998, the few Sagrantino vines still flourishing within the city walls of Montefalco were labeled and classified with some dating back to the 1700's and 1800's. Several of these vines grow in the ancient monasteries of St. Claire and St. Leonard, proving its sacred nature and lineage. Between 2000 and 2008, Sagrantino production quadrupled from 666,000 to over 2.5 million bottles, with a total value estimated at 60 million Euros. The area of vineyards bearing the Sagrantino D.O.C.G. designation has grown five times its original size. 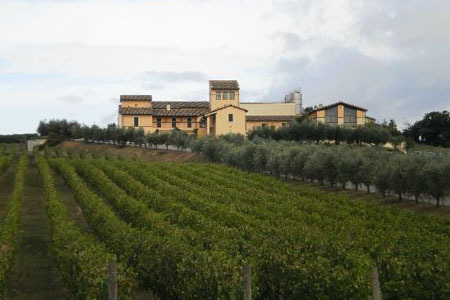 Lately, over thirty new wineries producing Sagrantino have been built. The quantity of Sagrantino is surging, matching its increase in quality. Between 1975 and today there have been four excellent ‘five star’ vintages: 1985, 1990, 1998 and 2005. Salute! Only 100% Sagrantino grapes are used in the production of Montefalco Sagrantino. This grape grows exclusively around the hilltop town Montefalco and boasts unique characteristics that bear no similarities with any other grape variety in Italy. The production is limited – the bunch itself is small and the skins of the grapes are extremely thick. The wine has a very strong structure with an extremely high concentration of polyphenols. Sagrantino di Montefalco is a powerhouse red – a dark purple liquid, elegant with robust flavors and full of tannins, perfect for long aging. Served with meats and hard cheeses. The traditional Passito (sweet wine) is obtained from the same grape. The clusters are carefully selected and left out to dry on a trellis for at least two months. The grapes are then pressed after which the must is left to ferment together with the grape skins. This way, the wine becomes very sweet: sweet yet structured, thanks to the high tannins. Montefalco Sagrantino Passito is described as a meditation wine – one that deserves focused reflection. Passito is excellent when paired with aged cheeses or dry sweets. 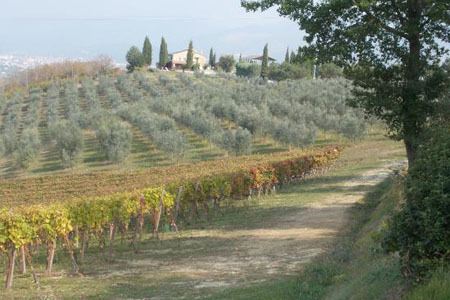 Sangiovese grapes in Montefalco are widespread, as in many other areas of Central Italy. 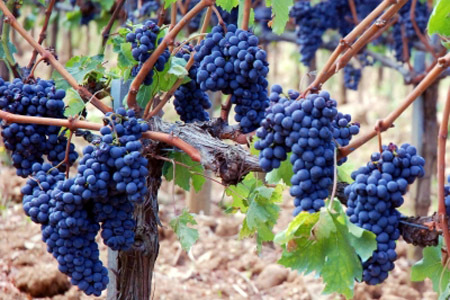 Produced from these grapes, Montefalco Rosso takes its origin in combination with the Sagrantino grapes that gives this wine the structure and characteristics typical of the area. This white wine is based on other typical grapes of the area named Grechetto and Trebbiano. Grechetto provides floral flavors and the Trebbiano adds a crispy freshness to the wine. Mentioned in many medieval documents and was once owned by a bishop, this is an estate with great history. 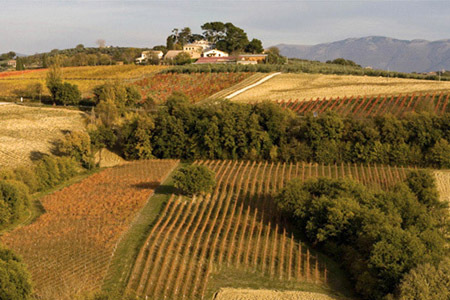 In 1881 Francesco Antonelli purchased the property and began updating the farming techniques for planting vineyards and olive groves. The estate started selling wine in 1979. The family is passionately committed to caring for their territory and attentive to the quality of all their products. Antonelli San Marco is home to “Cucina in Cantina”, a well-known cooking school offering courses in Umbrian cuisine. 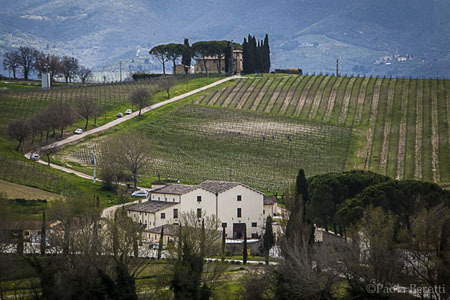 One of the oldest estates located in the heart of the Montefalco appellation. The winery was named after an exorcist who lived close by. Built in the 1850's as a classic manor, the winery was purchased by the Pambuffetti family in 1954 then recently remodeled with modern machinery and practices. The latest developments create an inspiring environment for producing wines of the highest quality. During the last few years, Scacciadiavoli has released sparkling wines made from Sagrantino grapes. Owned by the Bartoloni family, this state-of-the-art winery was built in 2011 complete with the most sophisticated wine-making equipment. The family has a long history in agriculture dating back to the 1800's and over 60 years of wine producing expertise. The latest generation, Paolo Bartoloni, is dedicating his life to growing the winery and producing outstanding wine, olive oil, and other products from crops planted on the farm. When Arnaldo Caprai started the winery in 1971, there was a renewed interest in Sagrantino. Since then, with the help of his son Marco, Sagrantino has become appreciated throughout the world. His philosophy is to aim for excellence, research and innovation in the agronomic and enological sector, along with communicating the culture and identity of the region. Arnaldo-Caprai was awarded “European Winery of the Year” for 2012 by Wine Enthusiast Magazine. Three generations are personally involved in this farm, with its unique soil and microclimates creating their own ecosystem. In 2008 the Romanelli’s placed live webcams inside artificial bird nests located throughout their vineyards to protect some endangered species including falcons and owls. As a result, their ecosystem uses birds instead of pesticides, thereby eliminating chemicals and allowing the vineyards to produce wine in a totally pure nature. 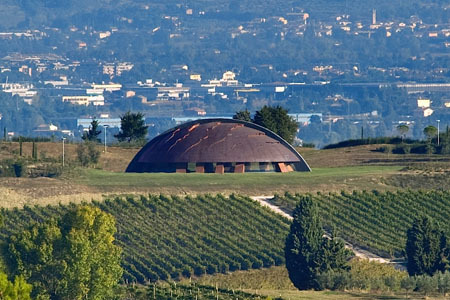 Designed by the legendary Italian sculptor Arnaldo Pomodoro, this sensational new modern winery is part building, part sculpture, and part land art. The estate features “Il Carapace” (the tortoise shell) – a flat, copper dome with a pattern of grooves and cracks depicting the landscape of soil – with a secular cathedral motif that guests can enter. The winery also has a dramatic tasting room upstairs under the dome, an equally striking cellar space downstairs, and breathtaking outdoor seating with panoramic views.